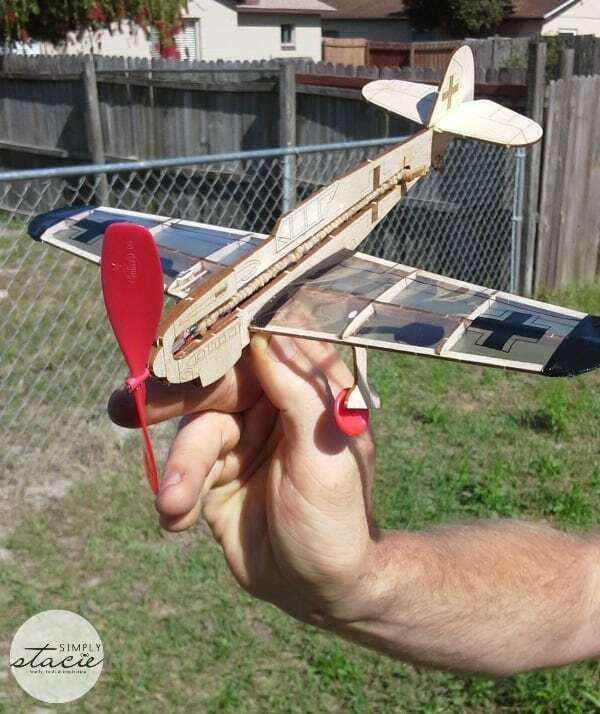 When I mentioned that Guillow’s had released six new modernized model airplane kits, I didn’t expect my husband to get giddy with excitement. He and my eight year old son love to build toy models together and both enjoy woodworking. Therefore, I knew that this would be the perfect father and son bonding project and a great way for the kids (and adults) to put away the electronic devices and spend quality time together! Guillow’s Classic Balsa airplanes have been around for an almost 88 years! In fact, my eighty year old father-in-law is visiting with us and said that he remembered paying less than a quarter for this favorite toy when he was a little boy. The Guillow’s 4500 miniModels Series includes popular glider models such as the U.S. Hellcat, U.S. Warhawk, German Fighter, Rockstar Jet, V-Tail and Stunt Flyer. 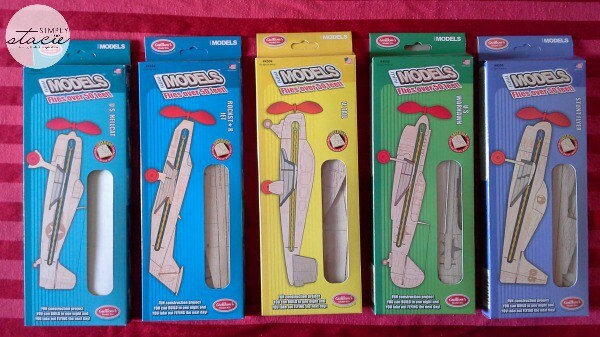 These six miniModels are made of balsa wood and includes extras such as propellers, stickers and landing gear. The attention to detail on all of the toy airplanes is fantastic and my husband and son were very impressed…..they couldn’t wait to get started building. 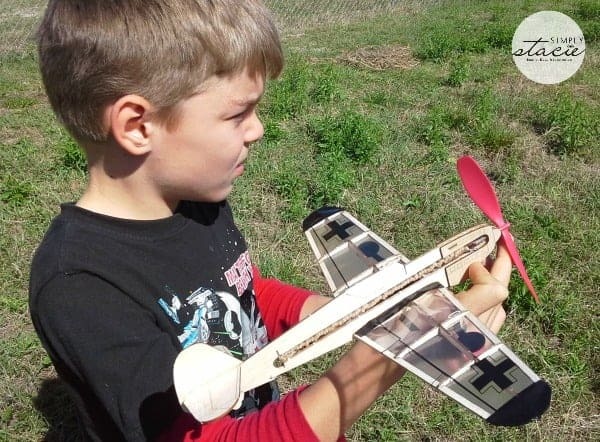 Their first project was the German Fighter which includes detailed and easy to follow instructions. While recommended for ages 13 and up for those building the miniModel independently, my eight year old son was fully participate by either assisting his dad or even building some areas all by himself with my husband supervising. It took about 3 hours (off and on) to build this model and it was fun for me to watch them working on it together. They had a blast gliding their toy airplane in the field once it was built and after several “crash landings” we were all very pleased that the airplane was still intact for future flights. Launch the glider in just the right way and watch it soar…..so neat! My guys can’t wait to build their next Guillow’s Classic Balsa Toy airplane and they have chosen the Stunt Flyer as their next project. Each of the model airplane toys in the Guillow 4500 series collection is very attractively priced at only $8.99 each which is an excellent value in my opinion in terms of overall quality, entertainment and excitement factor. You are invited to visit Guillow to browse the entire collection and you can even check out the 3D models that you can control online with just the touch of your mouse! These would make wonderful gift ideas for someone special and these miniModel kits would be perfect for Easter baskets too! You can shop online at the website or find these products at many major hobby shops (find a store near you at Guillow’s).